RASopathies constitute a heterogeneous group of disorders with a common molecular pathogenesis and overlapping phenotypic patterns. Noonan, cardiofaciocutaneous, Costello, and LEOPARD syndromes belong to this group, as well as neurofibromatosis type 1 and Legius syndrome. Dysregulation of RAS-dependent signaling due to a germline mutation in one of the pathway components cause a variety of developmental abnormalities such as heart defects, short stature, facial anomalies, cognitive impairment and others. Interestingly, based on the known molecular basis and supported by preliminary animal studies, RASopathies are considered as disorders that might be amenable to treatment with small molecules. However, translation into clinical trials is still hampered by a limited understanding about the precise mechanisms on cellular and organ levels. There is also a lack of valid genotype-phenotype and long-term follow-up data, making it difficult to define therapeutic targets. This consortium aims to fill some of these gaps by a multidisciplinary and multimodal approach. GeNeRare aims to address in particular the pathophysiology and molecular pathogenesis of organ involvement that is critical for long-term outcome, namely development of hypertrophic cardiomyopathy and neurocognitive impairments. But the consortium will also study novel aspects such as epidermal differentiation and cellular senescence. Collection of valid genotype phenotype data as well as the investigation of neurophysiologic parameters in affected humans define further lines of translation of basic research to patient care. Cell Commun Signal. 2018 Dec 5;16(1):96. doi: 10.1186/s12964-018-0307-1. Haghighi F, Dahlmann J, Nakhaei-Rad S, Lang A, Kutschka I, Zenker M, Kensah G, Piekorz RP, Ahmadian MR.
Hum Mol Genet. 2018 Nov 27. doi: 10.1093/hmg/ddy412. Motta M, Fidan M, Bellacchio E, Pantaleoni F, Schneider-Heieck K, Coppola S3, Borck G, Salviati L, Zenker M, Cirstea IC2, Tartaglia M.
Hum Mutat. 2018 Nov;39(11):1485-1493. doi: 10.1002/humu.23624. Grant AR, Cushman BJ, Cavé H, Dillon MW, Gelb BD, Gripp KW, Lee JA, Mason-Suares H, Rauen KA, Tartaglia M, Vincent LM, Zenker M.
PLoS Genet. 2018 May 7;14(5):e1007370. doi: 10.1371/journal.pgen.1007370. eCollection 2018 May. zum Büschenfelde UM, Brandenstein LI, von Elsner L, Flato K, Holling T, Zenker M, Rosenberger G, Kutsche K.
J Biol Chem. 2018 May 4;293(18):6762-6775. Baran P, Hansen S, Waetzig GH, Akbarzadeh M, Lamertz L, Huber HJ, Ahmadian MR, Moll JM, Scheller J.
Crit Rev Biochem Mol Biol. 2018 Apr;53(2):130-156. doi: 10.1080/10409238.2018.1431605. Nakhaei-Rad S, Haghighi F, Nouri P, Rezaei Adariani S, Lissy J, Kazemein Jasemi NS, Dvorsky R, Ahmadian MR.
PLoS One. 2018 Mar 7;13(3):e0192652. doi: 10.1371/journal.pone.0192652. eCollection 2018. Dahlmann J, Awad G, Dolny C, Weinert S, Richter K, Fischer KD, Munsch T, Leßmann V, Volleth M, Zenker M, Chen Y, Merkl C, Schnieke A, Baraki H, Kutschka I, Kensah G.
Gelb BD, Cavé H, Dillon MW, Gripp KW, Lee JA, Mason-Suares H, Rauen KA, Williams B, Zenker M, Vincent LM. Genet Med. 2018 Feb 22. doi: 10.1038/gim.2017.249. Sci Rep. 2018 Feb 16;8(1):3217. doi: 10.1038/s41598-018-21344-7. Am J Med Genet A. 2018 Feb;176(2):470-476. doi: 10.1002/ajmg.a.38569. 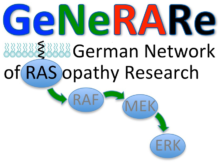 Harms FL, Alawi M, Amor DJ, Tan TY, Cuturilo G, Lissewski C, Brinkmann J, Schanze D, Kutsche K, Zenker M.
Genotype and phenotype spectrum of NRAS germline variants. Eur J Hum Genet. 2017 Jun;25(7):823-831. Altmüller F, Lissewski C, Bertola D, Flex E, Stark Z, Spranger S, Baynam G, Buscarilli de Moraes M, Dyack S, Gillis J, Yntema HG, Pantaleoni F, van Loon RL, MacKay S, Mina K, Schanze I, Tan TY, Walsh M, White SM, Niewisch MR, García-Miñaúr S, Plaza D, Ahmadian MR, Cavé H, Tartaglia M, Zenker M.
PLoS Genet. 2017 Jun 16;13(6):e1006843. doi:10.1371/journal.pgen.1006843. eCollection 2017 Jun. Altmüller F, Pothula S, Annamneedi A, Nakhaei-Rad S, Montenegro-Venegas C, Pina-Fernández E, Marini C, Santos M, Schanze D, Montag D, Ahmadian MR, Stork O, Zenker M, Fejtova A.
PLoS One. 2016 Dec 9;11(12):e0167145. doi: 10.1371/journal.pone.0167145. Nakhaeizadeh H, Amin E, Nakhaei-Rad S, Dvorsky R, Ahmadian MR.